Rising atmospheric CO2 concentration will affect belowground processes and forest function. However, the direction and magnitude of change for many soil processes are unknown. We used minirhizotrons to observe fine root and fungal dynamics in response to elevated CO2 in a model regenerating longleaf pine community in open-top chambers. The model community consisted of five plant species common to xeric sandhills longleaf pine stands: Pinus palustris, Quercus margaretta, Aristida stricta, Crotalaria rotundifolia, and Asclepias tuberosa. Elevated CO2 significantly increased both fine root and mycorrhizal tip standing crop by more than 50% in the deeper soil horizon (17–34 cm). Rhizomorph standing crop was nearly doubled in both deep and shallow soil (P = 0.04). Survivorship results for fine roots and rhizomorphs varied between soil depths. 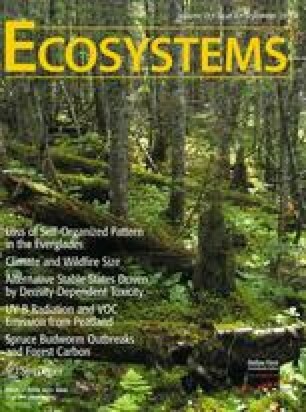 Fine root survivorship was likely influenced more by changes in community composition and species interactions driven by elevated CO2 rather than by direct effects of elevated CO2 on the fine roots of individual species. In this system, it appears that elevated CO2 led to a greater reliance on fungal symbionts to meet additional nutrient requirements rather than substantially increased root growth. LM wrote the paper, performed research. SGP designed study, performed research, analyzed data. SB performed research. MD performed research. SAP conceived of design. GR conceived of design. RM conceived of design, contributed new methods. HR conceived of the design. This work was supported by Office of Science Biological and Environmental Research (BER), US Department of Energy, grants no. DE-FG02-95ER62083 and DE-FC02-06ER64156 and partially supported by NSF grant IOB 0613832. Barry Dorman and Tammy Dorman are thanked for their technical assistance. David Eissenstat is thanked for his support and encouragement.